Today was the best day so far for the kids as a group… with one pretty significant snag. For the first time I took the kids out of the house. They’ve been getting so stir-crazy from being cooped inside for the last week solid that I had to take them out, or I’d have gone nuts. They rode their bikes to a nearby park, and I took Josh in the stroller. We played for a couple of hours with very little trouble. A couple of kids fell off their bikes a few times, but no major bleeding, or broken bones, so all was well. Evan got home, and we had lunch, and then for quiet time Lukas lost the privilege to watch a movie in the living room, so he got put in one of the bedrooms. Jacob decided he wanted to take a nap, and Evan and Joshua were so tired that I knew they’d sleep during quiet time. So, after getting everyone down I laid down on the couches in the living room with Maren and we started our movie. I was so relieved when I didn’t have to stay up to fight to keep Lukas in his room. About an hour and a half into quiet time, right when I’m gearing up to go wake up kids and start cleaning up before dad gets home, Lukas screams from the other room and comes running into the living room with a cut on his forehead. At first, because there wasn’t much blood, and because he wasn’t doing the ‘I’m mortally wounded and unconsolable’ scream, I had him show me what had happened. Turns out, he was sitting on a small desk chair in the room and spinning on it, when he fell off and hit his forehead on the desk. I told him to sit on the couch and calm down while I went and got something to clean the nearly dried blood off his face. Once I got up close to the cut I got a bit more scared than I had been. The gash was about half an inch long, and I knew immediately that he’d need stitches. I called Richard and he left work a little early and took Lukas straight to the hospital. While they were gone, I got the other kids fed, bathed, and in bed. It was a bit difficult putting them down. They spent the whole evening worrying about whether or not their brother was going to come home from the hospital that day. 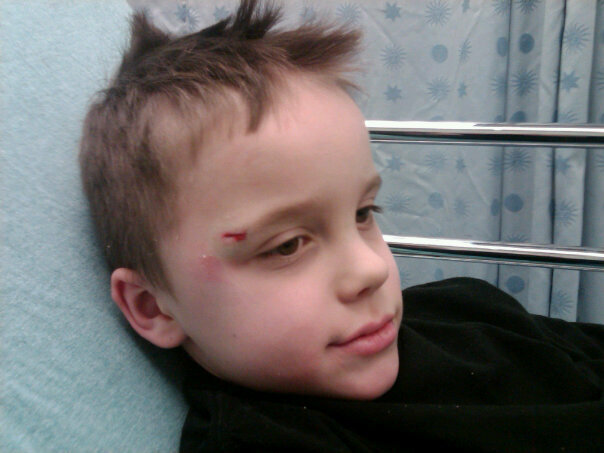 I’m sure they were convinced that the gash on his head required a 2 or 3 day stay in the hospital and major surgery. Well, 4 hours and 10 stitches later, father and son returned with the wound on the mend. Their return roused the whole house (they had only been down for about half an hour) and everyone had to see Lukas’ stitches. I left soon after that and I’m hoping that they went to sleep quickly, or I’m going to have some CRANKY kids in the morning. So, on the whole, while the kids were much better behaved today than they have been (they’re finally getting used to me being in charge. They don’t argue as much anymore, thank heaven. ), it was still just as eventful/stressful as any of the previous days. Here’s to hoping for a slow paced, dull day tomorrow, though, with 5 kids… I doubt I’ll be that lucky. Lukas at the hospital. Dad took this picture. I am eternally grateful to a loving Father in Heaven who knows exactly what I need when I need it. Tonight an old friend from high school said hi to me on facebook and we chatted for about half an hour or so about life; where we’d gone and what we’d done since graduation. Usually reunions like that tend to take a nostalgic turn, but this time, for whatever reason we spoke about our future. Our hopes, dreams, goals, education, and the like. Though the conversation was casual, I was uplifted and encouraged to continue working to achieve, specifically with my educational goals. Re-connecting with this friend and remembering our friendship was also a much needed boost. I don’t know that I’ve ever had a more whirl-wind week! Every day starts bright and early at 6 am when my alarm clock goes off. Not that I get out of bed at that time… I usually tell my phone to snooze at least five times before rolling out of bed. My day with the kids starts around 7:30 am. I’ll spare you the details of the daily routine. It usually contains swords/guns (both made out of the same blocks) and cars with their loud and frequent sound effects, colors and coloring books, letters, numbers, lunch time, diapers, wipes, messes, cleaning messes, whining, arguing, bargaining, ‘they touched me!’, ‘he broke/took my sword/gun/car!’, ‘Keely, can I ask you a question?’, ‘I want a snack!’, and (most mercifully) quiet time. Some days I’m able to stay on schedule, and others… well, it’s a miracle that I make it to the end of the day and I haven’t given one or 2 of them away. Quiet time usually ends just before their dad gets home from work, and then I get to come back home and pass out. Yesterday and today were spent in blessed relaxation. I’ve returned to music and being crafty as a means of therapy. I’ve made hats for all 5 kids, and spent my spare time listening to music that fills me up. I’ve also made time to read my scriptures every night, listen to a general conference talk every morning, and pray as many times as I can possibly fit in during the day. I am learning so much, and I can’t wait to see what fruits will be borne from this experience. The curtain rises early, and I’ve got my 8 hour warning, so it’s off to bed for me. The adventure starts again tomorrow! Tonight I watched the kids for Richard and Val while they went to dinner and ran some last minute errands before she leaves tomorrow. I’d been there all day, but I took over at about 6 ish and they got home around ten. It was a low-key evening just dinner, half a movie, and bedtime… and I’m exhausted! It didn’t seem like that much in the middle of it all, but once I had them in bed and I slowed down… I hit a brick wall. HARD. I’m really glad I got this small taste before I have to dive in head first on Monday. I am SO excited for the next two weeks and what they will teach me! 🙂 I feel that if I can do this, I can do anything! I know that my Heavenly Father is supporting me,and that as long as I don’t let him, the devil can’t have any say in how I feel or what I do. I know that every night I’ll be twice as tired as I am right now, but I know that this will push me to grow and change in ways that only God knows right now! I told the kids tonight that I’m going to be playing Mary Poppins for the next two weeks while their mom is gone. So, in true Mary Poppins form, I’ll take my spoonful of sugar, some laughter (ceiling tea-time not included), a bag of birdseed, some sidewalk chalk, throw in a bit of imagination, and it will be a supercalifragilisticexpialidocious two weeks!